Otto Neumann, Self Portrait, 1921. Oil on Canvas. Neumann's work evolved from strongly colored and thickly brushed paintings and sharp and angular black and white prints in the late teens and early 1920's, to late abstract prints in a variety of colors. Although his style and preferred mediums both changed through a long career, the human figure remained his most enduring and constant subject. Otto Neumann was born in Heidelberg, the third child of Fritz Neumann, a professor of Romance Philology at the University of Heidelberg. Neumann grew up exposed to his father’s circle of intellectual friends. Among them were prominent professors of art, literature, and medicine including Ernst Troeltsch and Max Weber. Books were a major part of his family life, and he was to use mythology, Dante's Inferno, and more modern works as the sources for his art. Neumann studied at the art academy in Karlsruhe. World War I interrupted his training, and he spent six months in the Rastatt Artillery before receiving a medical discharge. He briefly returned to Karlsruhe, then took private lessons from the landscape painter, Wilhelm Oertel in Mannheim before completing his training at the Academie der Bildenden Kunste in Munich in 1919. After returning to Heidelberg, he began to paint oil portraits, primarily of such major university figures as Max Weber and medical faculty members like Hans Prinzhorn. The latter was perhaps the father of art therapy, and recruited the young artist as part of a control group studying the effect of psychedelic drugs on patients. Postcard Invitation for Rare Nest's "Otto Neumann: Modern Degenerate" exhibition, January - March 2018. Illustration for Dante's Inferno, Canto 3, "These are the souls that - when alive - refused to take sides on the great political and moral issues..." Graphite on onion skin. Circa 1926. Rothschild Family Collection. All rights reserved. Neumann's early years as an artist were fertile, and he produced linoleum prints of scenes from the Passion of Christ, produced both watercolor and oil still-life paintings, and made pencil and charcoal drawings after the historical artists he most admired. He also completed a series of highly detailed graphite drawings that were based on each canto of Dante’s Inferno and several of Purgatory. And though he never utilized these drawings in a published edition of the Dante epic, they became known, and admired by scholars. He also made prints of many of the Dante subjects, though almost always one of a kind, and set up his unusual lifelong practice of sometimes signing the prints but never utilizing edition numbers. Neumann married his neighbor, Hilde Rothschild, on January 15, 1929, and their only child, Marianne, was born in November of that year. The family lived in Stuttgart for the next four years and, in addition to the Dante prints, the artist continued to work in all two dimensional media, with many drawings and watercolors of his wife and daughter. They moved to a suburb of Munich in 1933, with financial help from Hilde’s family, and lived in a house with a large studio for the artist, remaining there for the rest of their lives. The artist’s literary interests continue to be reflected, in drawings and prints based on African fairy tales, subjects from classical mythology, the Passion of Christ, and a group of fourteen linoleum prints adapted from Edvard Munch’s Alpha and Omega series. Except in the landscapes and a bit in the still life works, there is neither a background nor a ground, yet the figures seem firmly anchored in their settings. During this period, Neumann’s work begins to be recognized, and is shown in various exhibitions. He also attracted scholarly attention. 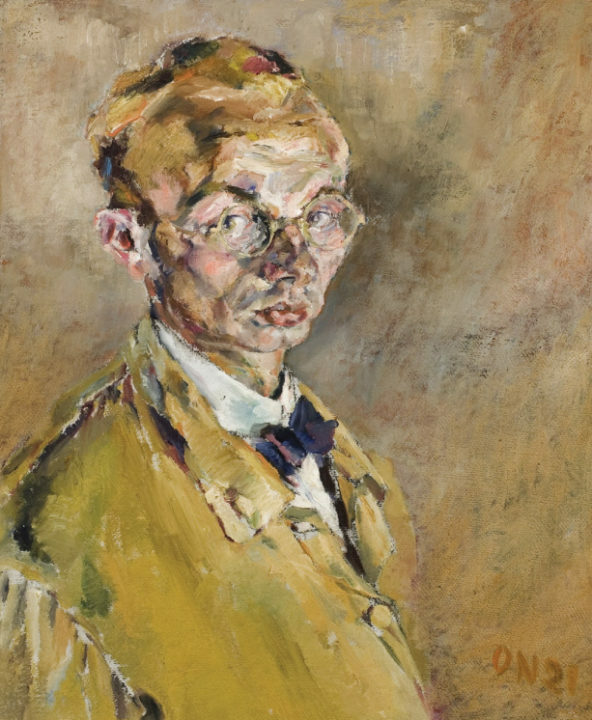 As the Nazi regime took hold of the country, Neumann’s work was considered degenerate and his refusal to divorce his Jewish wife to further his career set him aside from many of his friends who compromised their work and their associations. Deprived of a market for his work, and with Hilde’s family having left the country and no longer able to help, the artist worked as a technical illustrator of anatomical drawings for the Medical School in Munich, and when the school was destroyed, he was able to work on such drawings in his own studio. The Neumanns took in the contemporary writer Werner Bergengruen and his family when their home was bombed, and the artist made portraits of the family in addition to paintings and drawings based on his friend’s novels. By the mid-1950s, monotypes began to predominate in his oeuvre, mostly created on sheets of glass and increasingly abstractions of the human figure. The overt literary based subjects, and the more personal grotesques and composites of forms were replaced by simplified, though often interlocking forms, usually on a flat background. Hilde seems to have coped with their daughter’s death by returning to the weaving of her early years, and produced large woolen tapestries that exactly duplicated the form of individual Neumann prints. The artist also starts to give individual instruction to a number of students, and began to exhibit with groups of mostly younger artists. He also had work included in several small German literary magazines, which showcased the work of young poets and writers, and he clearly identified with the younger generation as his work grew more abstract. Still depressed and relying too much on medication for both physical pain and depression, the artist admitted himself to a homeopathic sanitarium in 1960 producing very small monotypes while there. After his release, he continued to take homeopathic medications and did exercise. His work got additional attention during the 1960s, and though he never made the journey, there were shows in the United States. When Hilde died in 1970, the artist had a burst of work and then stopped toward the end of 1971. Sales and proposals for exhibitions came from several countries, but he had lost interest in promoting the work. He remained at home, and died on January 2, 1975 after suffering a fatal heart attack. Several small exhibitions were mounted after his death, with a full retrospective appearing at the Heidelberger Kunstverein in 1982. Rare Nest is honored to represent the work of Otto Neumann. Download a complete 82 page catalog of the 1982 Exhibition "Otto Neumann" held at the Heidelberg Kunstverein (PDF - 14 MB). With great essays by Hans Gercke and Dr. David Sokol. Chicago Reader, Samarov, January 26, 2018: "‘Otto Neumann: Modern Degenerate’ shows an artist struggling through the hopelessness of 20th century Germany"
Read a Chinese language January 2018 article on Neumann and the Exhibitions at Rare Nest and State Street Gallery (external link).